North Korean leader Kim Jong-un visited industrial facilities in Beijing on Wednesday, a day after he met with Chinese President Xi Jinping in a show of close ties ahead of a possible second summit with US President Donald Trump. Kim visited a pharmaceutical factory located in the economic-technological development zone in the Chinese capital. Sources said that he spent around 20-30 minutes touring the plant operated by Tong Ren Tang, a drug-making conglomerate known for its long history of more than 300 years. After the tour, Kim returned to the state guest house. 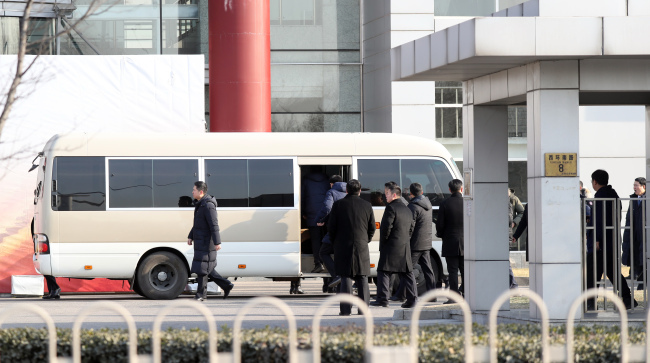 Kim left the guesthouse again around noon and arrived at the Beijing Hotel, where he is expected to have lunch together with Xi before heading back home later in the day. Kim embarked on a four-day trip to China on Monday afternoon. He arrived by train in Beijing on Tuesday and hours later held a summit with Xi. Details on what they discussed during the hourlong meeting have yet to be disclosed. Kim's trip to China, the fourth of its kind since taking office in late 2011, comes amid speculation that a second summit between the North's leader and US President Donald Trump is imminent. In his New Year's Day speech, Kim warned that he could go a new way if the United States clings to pressure and sanctions on its regime. He still kept the door open for talks with the U.S., saying he is willing to meet Trump at any time. Trump earlier said that the US and North Korea are in talks over where to hold their second summit and the decision on the venue will be announced in the "not-too-distant future." Last year, Kim traveled to China and met with Xi three times before and after he held his first-ever summit with Trump in Singapore in June. In the summit, Kim agreed to work toward the complete denuclearization of the Korean Peninsula in exchange for security guarantees. Progress, however, has been slow for months as the North calls for sanctions relief, while Washington says such concessions will not be granted until the North completely gives up its nuclear weapons.